While the Xbox One and PS4 versions of FIFA 14 will use EA's new Ignite engine, the PC edition will be left out of the game. Much ado was made at Microsoft's Xbox One unveiling about EA's new Ignite engine, which will be at the core of several of its major sports titles in the near future. The engine will apparently allow for faster behind-the-scenes calculations and better animations which should help make for better, more realistic experiences for the sports games built on its foundation. That said, it's been confirmed that certain versions of some EA sports games won't be utilizing the Ignite engine, namely FIFA 14 for PC. Communicating via Tweet, Rob Hodson, EA's community manager for the FIFA series, revealed that the PC version of FIFA 14 wouldn't be utilizing the Ignite Engine. 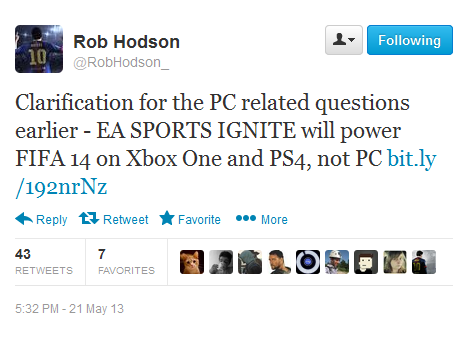 Responding to some follower's questions he wrote, "EA SPORTS IGNITE will power FIFA 14 on Xbox One and PS4, not PC." EA's reasoning behind the use of a lesser engine is yet unknown but past actions could shed light on the rationale behind the decision. When FIFA 09 was released on PC, many unhappily noted that it was different from the versions being released on the PS3 and Xbox 360. EA at the time claimed the differences were to make the game accessible to a wider variety of PCs, whereas a version equivalent to the console game would have limited it to a mere "1-3% of PC systems on the market." Similarly, FIFA 10's visuals on the PC were inferior to its console counterparts. On the one hand, it makes sense for EA to be interested in making sure FIFA, which enjoys wide popularity around the world, to be accessible to as many players as possible. That said, if the improvements offered by the Ignite engine wind up being truly dramatic, the continued hobbling of PC versions could arguably convince people to abandon them for console next-gen console editions, in which case a wider range of capable PCs won't matter all that much.